Duskers is a defiantly singular game. It’s “indie” in more of a “to hell with it, this one’s for me” kind of way rather than as a way to denote studio size or aesthetic. It’s unforgiving and, at first glance, deliberately obscure. You control drones exploring derelict starships in a galaxy that has gone dead, gathering scraps of supplies and avoiding combat at all costs. You have to meet Duskers on its own terms, because it makes few concessions. It’s also Misfits Attic’s second game, and a passion project for designer Tim Keenan. It’s the game he started making just as he started to realize his indie dream was about to die. Duskers was how Keenan was choosing to go out, and he suspected he’d never even be able to finish it. Then the indie community came to the rescue. “Maybe I’m a brat,” Keenan muses over the phone. It’s the first thing he says when I ask him why he risked so much to start a game studio. Keenan had a successful career at Dreamworks Animation, working at the intersection of art and technology. That’s the place where he says he’s happiest. When he tries to explain in layman’s terms what he did there, he points to the details you might notice in a few of their films. The way clothing moves on characters’ bodies in Shrek, the way fire burns in How to Train Your Dragon, or the way the jungle seems alive with gentle breezes and movement in Madagascar. That’s the kind of work Keenan did. The kind of stuff that’s important, but is almost invisible to the audience watching the film. A lot of independent developers you talk to didn’t really leave all the much behind. Even the ones who seemed to have thriving careers with major studios will usually be the first to tell you about how dysfunctional it all was, and how poorly they were treated. They leave behind job security (whatever that means in the game industry) and are usually only too happy to embrace the lower pay and greater fulfillment of indie development. Keenan wasn’t in that boat. He had a good job where he was paid and treated well by his employer, which made it 180 degrees apart from his prior job in a mid-tier game studio. He lived in the Bay Area with his wife, had a mortgage and a nice house, and had even managed to build up quite a bit of savings. So why put it all at risk? Keenan’s desire for creative expression led him to games. Not only had he worked in development before, but it was a place where all his interests and skills aligned. “I’ve always loved games, and I felt like games were this culmination of all these interesting problems,” he said. “Telling a story, making an interface that’s intuitive, designing out systems that have to work together, and audio… all of these art forms layered on top of one another in this beautiful complicated thing. Keenan’s partner in Misfits Attic is his wife, Holly. They met when he was a first-year in college, though they would not become a couple until eight years later. She has her own career in the Bay Area tech community as a contractor. Despite her role as a part of Misfits Attic, she was not enthused about his career change. A freelancer contractor in the US can have an amazing career, but the job doesn’t come with benefits like health, dental coverage, etc. For a lot of people in the United States, most complete health coverage for a family still comes as part of an employment benefit package with a big company. Holly knew that Tim’s decision to go indie would have huge ramifications for their financial security, and could wipe out years’ worth of gains they’d made. Then, to top it off, she found out she was pregnant shortly after he’d given his notice at Dreamworks. “We knew we were in for it. We could have backed out,” Keenan says. He almost did. Discovering they had a child on the way made him look at the risks an entirely more sober light. After giving notice at Dreamworks, he’d been convinced to stick around long enough to collect his bonus (an unbelievably stark contrast to how Keenan had been treated when he worked at a games studio, where they liked to fire people just in time to deny them their bonus). Now, he was wondering whether he shouldn’t rescind his notice and stay on at his job. When he started to recoil from his decision, Holly steadied him. While she’d been slow to come around to the idea at first, she was perhaps even more certain than Keenan that it was the right decision. Keenan’s first game, A Virus Named TOM, proved to be much harder to make than he ever expected, and the sales results were far from turning independent game development into a decent income. Throughout it all, Keenan continued to burn through his savings. They had been substantial, but he and his family still lived in the Bay Area amidst soaring cost-of-life. Keenan admits, he was a bit stunned at how quickly even a small studio can eat up cash. TOM didn’t leave Keenan with a lot of money to continue making games. He was in a fatalist frame of mind when he started brainstorming for his next game. This was a game he’d probably never be able to finish before his studio shut down. So he just threw a lot of the more practical concerns out the window. He just started working on a game idea that had fascinated him for a while, and that he’d have fun working on. 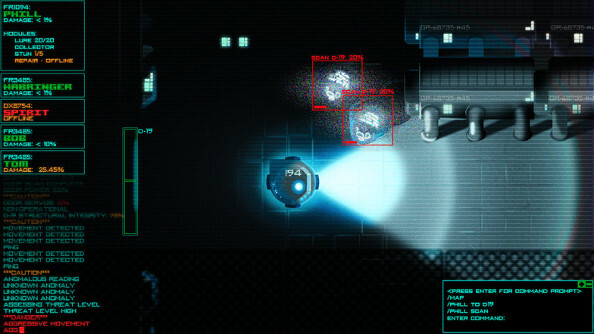 Duskers is about being the person in a darkened control room, gazing into a bank of monitors. Keenan modified the original idea so that you would be controlling remote drones through abandoned starships. It explained why you were controlling things that had no will of their own, that required an instruction for everything they did. “The story just kept getting darker and darker and I liked it more and more,” Keenan explains. It’s a fitting tone for Duskers. It’s a profoundly isolating game, where your only companions are these silent robots and whatever horrors await you aboard ship. In Duskers, everything in the galaxy is dead, or seems to be. As far as you know, you’re the last person in the universe. Monsters and other horrors lurk everywhere. You have limited supplies, and the only way to sustain yourself is by scavenging what the dead have left behind, with help of your small complement of drones. When you dock with a starship, you usually get a little log or info snippet from the vessel’s records. They are bit like the audio logs of System Shock: records from people on the brink of the apocalypse, capturing moments of dawning realization and horror. Through them, the outlines of a story are faintly visible, though Keenan isn’t sure how it will look just yet. After you dock with another vessel, you send you drones aboard. Here’s where Dusker’s minimalism really starts to cast its spell. Each Roomba-like drone casts a small cone of watery light in front of it, and practically everything is done in the greyscale of a night-vision display or a security camera. It amplifies your distance from everything, how little you can actually see and sense for yourself. When you screw up and a drone gets in trouble, you get only the briefest glimpse of something rushing into your headlights before the feed cuts out and the drone goes dead. 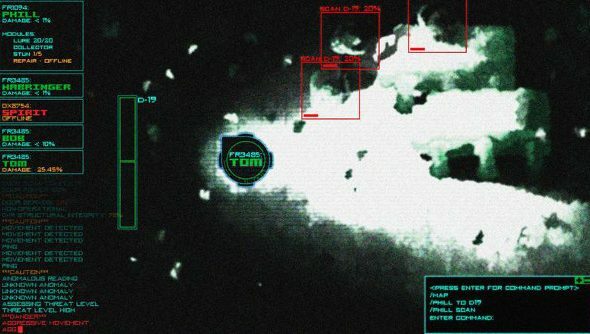 You command the drones using text. The commands are simple, but it takes a little while to get comfortable with the fact that you hardly touch your mouse and, really, rarely need to leave the schematic view. The command line interface is probably the most distinctive thing about Duskers, and may wind up being the most controversial. 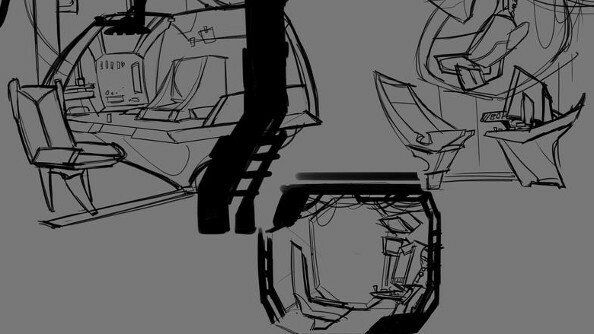 The idea originally came from another designer, Ian Stocker, who saw Keenan working on Duskers at TIGJam. Keenan explained that he wanted a kind of low-tech, gritty feel to the technology in the game. Stocker immediately suggested making players use command lines. Keenan knows this may be a dumb idea that ends up turning away a lot of players, but it was born of the defiant mood he was in at the time. So he silenced the voice in his head that was asking why he was making something that would be intimidating to a more general audience. Besides, it’s fundamental to the way he wants players to feel toward the technology in the game. “I feel there is this diction between you and a technological device. You are communicating with it. And I feel like when I type in words and hit ENTER, there is this wonderful barrier between me and the machine that I am trying to break with some form of natural language,” he explains. It might be archaic, but it also heightens your sense of distance and dependence as you try and get your drones to help you gather enough supplies to survive another day. It also gives Duskers a deliciously awkward, frantic feeling when things go wrong. 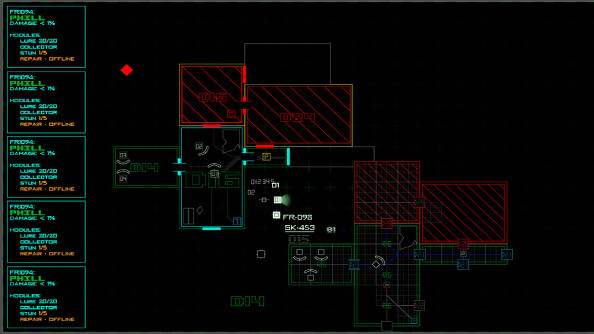 In one mission, I was slowly trying to make my way to a supply locker when suddenly hatches started failing and my motion sensor lit up with monsters moving into the adjoining rooms. Meanwhile, radiation was flooding through the ship and more hatches were starting to malfunction. I’d never seen any of this happen before, and immediately started trying to organize my evacuation. I started slamming hatches closed using a series of simple commands “d18” “d17” “d15”. Then I ordered my robots to head back to the airlock, typing “navigate r1 1 2 3” to tell all three of my drones to head back to the to the first room they’d visited: the airlock. Then I realized that one of my drones was carrying the portable generator that enabled me to power the hatches in this section of the ship. In my moment of panic, I’d cost myself control of the hatches and trapped my drones. I had to order Drone 3 back to the power coupling, regardless of the radiation starting to flood into the area. Hatches were continuing to fail, whether because of some kind of monster ripping them open or related to whatever malfunction was causing the radiation spike. It powered up the doors and opened the escape route for Drones 1 and 2. They obediently trundled home while I was finally able to get Drone 3 moving back toward the exit. But I’d waited too long: even as it tried to escape, another hatch burst open behind it. Drone 3 tried to run for it, but suddenly swarm of… something swept over it and smothered it. Seconds later, it shut down and I lost the feed. “Home” I typed, calling an end to the mission, having lost a precious, equipment-laden drone. It had been a weirdly dramatic, yet detached encounter. Which is exactly how Keenan wants it to feel. “Because we’re not used to command lines as much — unless you use Linux a lot of the time — using them also makes it feel more realistic. You imagine yourself in this little metal capsule, and you’re realizing that your fate is in the hands of this machine. And it feels very cold,” he says. The funny thing is that most people who play Duskers, including me, eventually embrace the interface. But it still seems like a dangerous idea. If you want to get meta about it, you can see Duskers as being about Misfits Attic’s own predicament. Keenan admits as much. The game begins after you have been out of contact with rest of the universe for an entire year. You have only a little more food to sustain yourself, and getting to any other location will end up consuming most of it before you ever get there. And, in the game’s alpha state, there is absolutely no hope for ultimate survival. You try and outrun the inevitable for as long as you can, before you either starve or get wiped out. By the end of the spring, Keenan was forced to accept that his indie adventure was coming to an end. He was practically out of money to continue paying the other developers he works with, and he was going to need to take up contracting to keep paying his bills. The last month of development, Keenan couldn’t pay his staff and the jig was truly up. While he pitched one of his full-time developers on going into contract-work together, he broke the news to everyone else that he couldn’t pay them anymore. “I really thought it would be a lot worse,” Keenan says. With a team that mostly worked remotely, and that he could never pay well during the best of times, he didn’t feel like he had any claims on their loyalty and certainly didn’t think they’d continue to stand behind Duskers. That vote of confidence was nice, and bought him a little more time, but Keenan knew could not go on without more money. It wasn’t just his team that were bearing the weight of this, it was also his family. Keenan’s last roll of the dice came with The Indie Fund. To Keenan’s chagrin, but not surprise, he was turned down. Duskers was not far enough along and didn’t look like it quite fit the bill of what the Indie Fund is about. It was too early in its development, requiring a lot more than the kind of “last mile” help the Indie Fund is about. But even as the fund rejected Keenan, their refusal allowed a little bit of daylight. They said they’d be willing to throw some funding behind Duskers if it was the difference between the game getting made or not. Keenan understood that if he could close up his funding gap a little bit, the fund might decide to get him the rest of the way. The problem is, he still didn’t know how to do that. He was tapped out and didn’t know anyone who would be willing to invest. That’s when one of the people behind the Indie Fund, Ron Carmel, of 2D Boy and World of Goo, said he’d talk to some people that might be interested in Duskers. Keenan didn’t have a whole lot of hope that things would work out, though. He went back to Double Fine, who lend him workspace, and started not-so-gracefully letting his friends know that he was looking for contract work. Then he started getting emails from well-known indie developers, expressing interest in Duskers and pledging investment. Cliff Harris, of Gratuitous Space Battles and Democracy, was one of them. As was Super Meat Boy’s Tommy Refenes. It was like It’s a Wonderful Life, except that the people saving Keenan’s dream were basically strangers to him. When enough individual investors were lined up, the Indie Fund then kicked-in as well to get Duskers fully funded. In the space of 24 hours, he went from having no money to having enough funding lined-up to guarantee work for another year. The problem was, he was completely broke. He worried there was a chance he’d lose his team while the contracts went through, because he needed the cash in a matter of days, not weeks. Duskers’ alpha is an absorbing game of grinding, desperate hopelessness. But he hasn’t finished it yet. Now, with enough money in hand to continue working for another year, Keenan has a chance to write a happier ending. Duskers is available for preorder via its website.